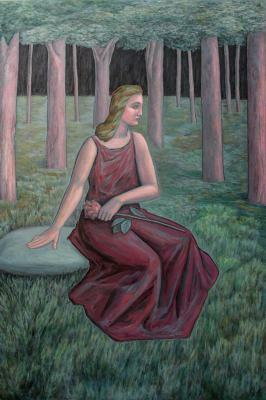 In this painting, a small representation of nature, the figure of a woman and a selection of living and inert elements are the only things we see. The ontological hierarchy of these beings is expressed here forcefully: in the centrality of the woman on the surface of the painting; in the symmetrical arrangement of the tree trunks in the upper section, around the woman’s own trunk or torso; and in the fusion of leaves that form a ceiling or canopy above her head, with the lower half of the painting reserved for her lower limbs and an array of inert and living elements that form a sort of seat and floor for the woman herself. Likewise, all of the woman’s figure seems to radiate from the vertex which is her head (see the geometrical analysis of this work). It is the human mind, through the higher faculties of intelligence and will, that is charged with the governance of all individual behaviour, both internal and external. Here the dignity of the human being, zenith of the universe, is represented in the image of a woman with Hellenic features and in classical attire. This visual device concords with the painting’s symbolic aspects, suggesting a timeless reality that finds expression generation after generation, as well as the periodic cycles of plant life. It is evident that the theme of this painting goes much deeper than the merely anecdotal or “picturesque”. Man possesses a dignity equal to that of woman, but their natural differences ―both physical and psychological― allow woman to be associated metaphorically to the world of plants, and man to the world of animals. Woman, like the flower, enriches the world with her grace and beauty, in contrast to man, whose significance lies more in his utility and his labours.